From hate to love! 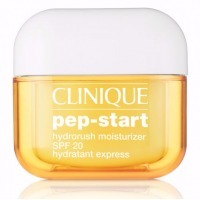 Clinique Pep-Start Hydro Rush Moisturizer. The face cream I never pinned my hopes on turned out to be a great find. Hello everyone! I’ve been using this moisturizer for 5 months now. Appearance: The jar is eye-catching among my stuff. It’s a bright yellow packaging. Not only does it look nice, but also reminds of the fact that it’s a sunscreen too. A cream that drives you crazy, and a little bit goes a truly long way. Why I use it in summer only? Glad you stopped by! Brief information: Weight: 1 oz 30 ml (there are also jars with 1,7 oz 50 ml) Price: $20 Made in the UK SPF: 20 Appearance: The cardboard box is small in yellow and white colors. When we open it, we see a cute yellow jar with a white lid. The NEW Clinique Pep-Start HydroRush Moisturizer. What to expect from the new range? Welcome to my review! Recently Clinique has released a new range of skincare products called Pep-Start . What is new here and how unique is the range? Let’s find out. Let’s start off by looking at the packaging. It has changed a little as opposed to the previous versions of the products.